Just got a smart TV? Find our Footloose travel films on Amazon Instant Video in HD (with subtitles if you want) amazon.co.uk/dp/B01NBF2DP9 ~ amazon.co.uk/dp/B01N6AG1QC more soon! Becoming a best seller ~ FOOTLOOSE IN ITALY IV! The Footloose in Italy IV web page is being developed... tune in! A copy of Footloose in the Italian Lakes has been dispatched to him. 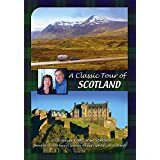 RELEASED TODAY: A CLASSIC TOUR OF SCOTLAND! Our 600-mile tour of Scotland DVD runs 150 minutes and is packed with stunning scenery, 4 walking trails, 4 castles and many feature items on our epic journey. Congratulations to Sonia W from Buxton, she has won our most popular film to date: FOOTLOOSE IN ITALY III DVD. A copy is being sent to her. Why don't you have a go this month? You can win A CLASSIC TOUR OF SCOTLAND DVD (available to buy in October). Congratulations to Steven B from Braunton, Devon, a copy of "Footloose in Switzerland" DVD has been dispatched to him. Try your hand this month! http://www.footloose.tv/FLE/Competitions.htm and win another. We are towards the end of researching and planning a classic tour of the most popular places in Scotland. Our accomodation on this trip will be our 1969 Airstream all-American vintage travel trailer. Whilst not specifically aimed at caravanners the DVD will have a comprehensive itinerary similar to a planned motoring trip or classic coach tour through this wonderful landscape. For walking enthusiasts, city trails in Glasgow and Edinburgh are on the agenda, and scenic walks on the Isle of Skye, at Culloden and Dunkeld. The CLASSIC TOUR starts inGlasgow, then Stirling, Loch Lomond, the Highlands, Rannoch Moor, Glencoe, Fort William, Skye, Loch Ness, Inverness, Aviemore, Pilochry, Dunkeld, Perth, Edinburgh. Planned features are likely to include: The Royal Yacht, Edinburgh Castle, Stirling Castle, the "Harry Potter" train, the Skye Museum of Island Life and the Culloden Battlefields. The finished 2hr DVD should be available in late September 2015 priced £11.99. Watch outfor it! This will compliment our popular and long running film, also shot in Scotland ~ Along the West Highland Way. A copy of Footloose in Italy III has been dispatched to her. Sorry we have been so late in the draw ~ we have been on a winter holiday. Footloose in Italy III has outstripped sales of all of our DVD titles and we hope it is set to be a firm favourite for years to come! Congratulations to May/June Winner Sophie R from Newcastle upon Tyne, She has won a copy of our FOOTLOOSE IN THE ITALIAN LAKES DVD. Now it's your chance to win our brand new FOOTLOOSE IN ITALY III for September/October, go to Competitions!